The King-Waldrop House is a two-story residence built c. 1881 that exemplifies features of both the Queen Anne and the Italianate building styles. Its most distinctive feature is a square three-stage cupola with a concave pyramidal roof. The house has irregular, blocky massing under front, side, and rear gables with wide eave returns. There are brackets under all the eaves. The second floor porch, which wraps around the tower, has been partially enclosed as a sunporch but still retains turned spindles. The original fabric of the house is relatively unchanged. The one-story rear section appears to have originally been a back porch that was enclosed. A one-story wing extending from the left side is an early 20th century kitchen addition. Most of the windows have 2/2 sash, but the third stage of the tower has 6/6 sash. The single front entrance door, which has a paneled lower half and glazed upper half, has a four-pane transom. All openings have wide plain surrounds. The interior of the house is simple in both its form and detailing. The floor plan consists of a central hall on both stories, with rooms opening from it. Downstairs, upon entering the house, the parlor is to the right and the dining room is to the left. The parlor is by far the most elaborately decorated room in the house. Its central feature is a delicate Victorian mantel with oval mirror above, probably an early 20th century replacement. A bay window projects outward at the front of the house. All woodwork, as everywhere else in the house, is dark typical Victorian. Floors throughout the house are hardwood stained dark. The dining room is the largest room in the house, expanded to its present size (by enclosing part of the front porch) when the Waldrops took in boarders around 1913. The mantel here is a simple, late Greek Revival style mantel with pilasters supporting a plain frieze and shelf that is probably original, as are mantels in all the remaining rooms in the house. Corner blocks on all the windows and doors are faceted. Windows in the dining room addition have bullseye corner blocks. Through the rear of the dining room, one enters a small screened porch and kitchen added to the house in the early 1900s. Originally, the kitchen was a separate building reached by a covered passageway from where the present kitchen is now located. Walls and ceiling in the kitchen are all painted beaded boards. Two bedrooms, one behind the parlor and one behind the dining room, complete the downstairs. Bedrooms throughout the house are simple, the only decorative features picture molding and simple original mantels. All doors are four-panel, some crowned by transom lights. Upstairs, there are six additional bedrooms opening off the central hallway. Stair balusters are simple in design. All walls retain original plaster finishes. Four of the six bedrooms are directly above the four downstairs rooms. 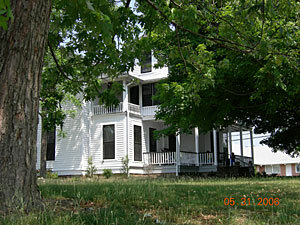 The other two were formed from part of the second story porch. Stairs wind upward from the second floor hallway to the cupola above, which is also a simple square room with minimal decorative features. Windows here are six over six, and walls are plaster. Overall, the interior of the house, like the outside, has retained its original integrity. Built as a large functional home and altered to accommodate a large family, it still maintains a feeling of spaciousness and simple, gracious comfort. 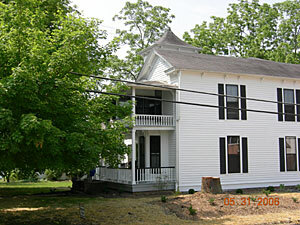 The King-Waldrop House (Maple Grove) is one of the few surviving 19th century dwellings in downtown Hendersonville. The once primarily residential Washington Street, two blocks from Main Street, is rapidly being encroached upon by commercial development. The house was built for Laura V. King, the daughter of Col. Valentine Ripley, one of Hendersonville’s earliest businessmen and entrepreneurs. Ripley was responsible for constructing some of the earliest buildings on Main Street. Col. Ripley died in 1879. On November 2, 1879, a deed was signed by Judge H.G. Edward, executor for the Col. Ripley estate, conveying property to Laura King "containing one acre more or less." This land was comprised of lots #92 and 93 of the original town plat for Hendersonville (Henderson County Deed Book 17, p.442). Mrs. King paid $700.00 for the property. The work on the house was probably finished in 1881 or 1882. The builder/architect is unknown. The Ripley family enjoyed early prominence in Hendersonville, especially the colonel himself. According to Laura's sister, Lila Ripley Barnwell in an article that appeared in the Times News on August 29, 1938, "Colonel Valentine Ripley, a native of Rockbridge County, Virginia, came to this section in the (eighteen) thirties, settling first in Asheville, where he married Miss Ruth Smith, daughter of James Smith, who was the first white child born west of the Blue Ridge in North Carolina. Shortly afterward Henderson County was cut off from Buncombe, and because of interest in the mail route, Colonel Ripley came here to live. He had large land interests, owning thousands of acres in the county. No citizen was ever more interested in the progress and development of this section. After the War Between the States, Colonel Ripley formed a partnership with Captain M.C. Toms in the mercantile business. He was too much a lover of the out of doors and fine horses to like the confinement of that life, and while he carefully attended to the business the practical management was left largely in the capable hands of Captain Toms. One of the greatest ambitions of his life was a railroad for Hendersonville and for years he spent time and money for this accomplishment, living to see his dream realized about four months before his death in 1879." The King-Waldrop House's distinctive styling, accentuated by an eye-catching tower, is a fitting reflection of the Ripley family's prominence in the community. The importance of the house as an indicator of Laura King's perpetuation of the family's high social standing is augmented by its location on a portion of her father's extensive land holdings and the fact that it is the only remaining, relatively intact residence associated with the early generations of the Ripley family. In 1897, Laura King and Dr. J. G. Waldrop consummated a delightful trade between friends: house for house. Dr. Waldrop, a local general practitioner, began to look about Hendersonville for a home with ample space for his wife Nancy and their eight children. On October 21, 1897, Dr. and Mrs. Waldrop joined Laura King at the courthouse to sign over each of their properties to the other. Mrs. King paid $1,000.00 for the Waldrop property, while receiving $1,500.00 for her own. The Waldrops received "...the Laura King homeplace on Washington St. and Chestnut St..." along with about 3/4 acre of land (Henderson County Deed Book 36, pp.476-478). This property has remained in the Waldrop family, and by cherishing their home, they have maintained a link with Hendersonville's past. Numerous newspaper items about Dr. and Mrs. Waldrop, who christened their new home "Maple Grove," recall the high esteem in which they were held by the citizens of Hendersonville. Traditionally, physicians were considered community leaders due to their healing abilities and professional contacts with so many of their fellow citizens, and apparently Dr. Waldrop was no exception. Undoubtedly, the spacious King-Waldrop House filled with the large Waldrop family was a focus of the neighborhood and Hendersonville social life generally, as suggested by notices of parties and other family activities. The King-Waldrop House is one of the few surviving homes in an area of Washington Street which was once mainly residential. It is also a good example of Queen Anne/Italianate homes from the late 19th-early 20th century period of growth in Hendersonville. It is still used as a residence in an area that has become primarily commercial. It is representative of the Residential Buildings property type and its relationship to Hendersonville is explained in "Residential Development in Early Hendersonville, N.C. 1879- 1929," Hendersonville Multiple Property Documentation Form. The house also is an important reflection of Hendersonville's late 19th and early 20th century social history as the home of two of the town's most prominent citizens, Mrs. Laura King, daughter of esteemed local businessman and entrepreneur Col. Valentine Ripley, and Dr. J.G. Waldrop, Hendersonville's leading physician from c. 1880 to 1910.